Ghazal, my Dear, Did you recognized that daylight lasted for 2 minutes longer today than it did yesterday ? I hope you experienced some sun shine altogether in Stockholm. But even if it was just another dim day today, you should be happy to know that from today on we will have more and more daylight, since today is Yalda, and this marks the rebirth of the sun. So nice that you remembered Yalda. Nobody in the Lab knows about it: everybody is preparing for the swedish Jule, and this usually is big business. I liked the poem by Hafiz. Do you know why it is called Ghazal No. 113, why it does not has a proper title ? I assume because Hafiz was not only a big poet, but also in love with numbers. Today we had to switch on all lamps at home, to really believe that light will come back now. It is really dim the whole day long, and it makes people depressive. In Persia, from where the tradition of Yalda originates, the sun does not completely disappears in winter time, as it is here in Skandinavia. I hope you are fine and can go Skiing at the Zugspitze already. It was nice there, I would like to go again. Ghazal dear, Hafiz wrote 495 Ghazals, he was really productive. If he would have ever met you, I’m sure he would have found inspiration for at least 5 more. Consequently, he might have succeeded to write up to Ghazal No. 500, and this last one would be the Ghazal about Ghazal. This, for sure, would have been the essence of all other 499 Ghazals and the most enchanting one. Although it goes back to zoroastrian and christian-syrian mythology, people still celebrate it today. 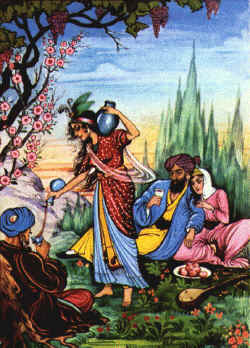 Hafiz poetry is red, and special menues prepared. Although the current regime does not like pre-islamic traditions, Yalda experiences a renaissance among educated and cultured families in present Iran.